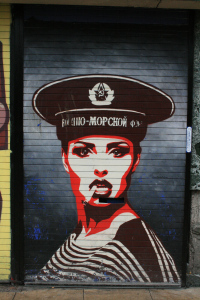 One of my favourite street artists is Tankpetrol. 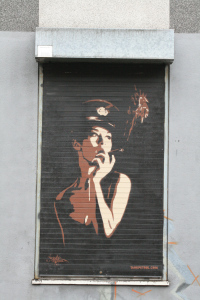 Like many street artists, there isn’t too much information available online about Irek Tankpetrol. The biographical information that is available mostly repeats the same information; he is Polish and now lives in Manchester. 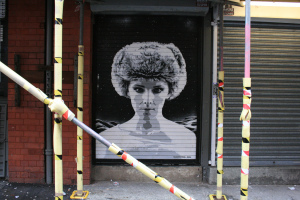 I love the scaffolding around the last photo that provides a natural street framing for the piece. 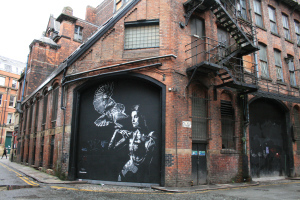 Further meandering around the streets of the Northern Quarter led to another piece, quite large of woman with an owl. 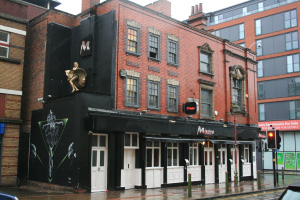 This was on Mangle Street. 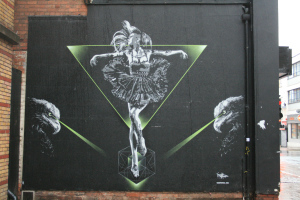 The owl piece has parallels with the one below that is in Birmingham, on the side of ‘The Missing Bar’, Bromsgrove Street. It again features a woman in the centre with two eagles.